Fraser Island, listed as one of the prized World Heritage sites in Australia, boasts an amazing network of freshwater lakes that is half the number of the identified perched lakes in the world. Many adventurers and travellers flock to Fraser’s remarkable water spots to camp or enjoy a picnic, swim, or simply to marvel at the awe-inspiring beauty. One of the natural attractions on Fraser Island that continues to invite travellers is Lake Wabby. “Of the 40 perched dune lakes on Fraser Island, Lake Wabby is the deepest at 11.4 metres,” according to QueenslandAustralia.com. The Department of National Parks, Recreation, Sports and Racing, however, advises against diving, jumping or swimming in the lake as serious injuries have occurred. Unlike Lake McKenzie and the other Fraser Island lakes which contain high acidity levels, Lake Wabby’s is fairly low, allowing it to house most aquatic life. Several species of fish that live in the lake include the catfish and rainbow fish, and the rare honey blue-eye. So don’t be surprised if something brushes or tickles your leg when exploring the lake. Taking a trip to Lake Wabby also means that you become a part of the rich history of the area. Lake Wabby is an area of high significance to the traditional Butchella poeople and was a mens only area. Lake Wabby is ever changing. Experts advise tourists to enjoy the beauty of Lake Wabby while it lasts, since a hundred years from now one of Fraser Island’s jewels may be no more. Being a barrage lake, the giant sand dune that borders Lake Wabby’s emerald green waters will eventually move into the lake and occupy its waters. In a century or so, the sand dune’s inexorable march westward across Fraser Island will see it completely swallow the lake. Hammerstone sand blow advances at the rate of around 1 metres a year and will eventually swallow the lake. Among Fraser Island lakes, Lake Wabby is truly one of its kind. 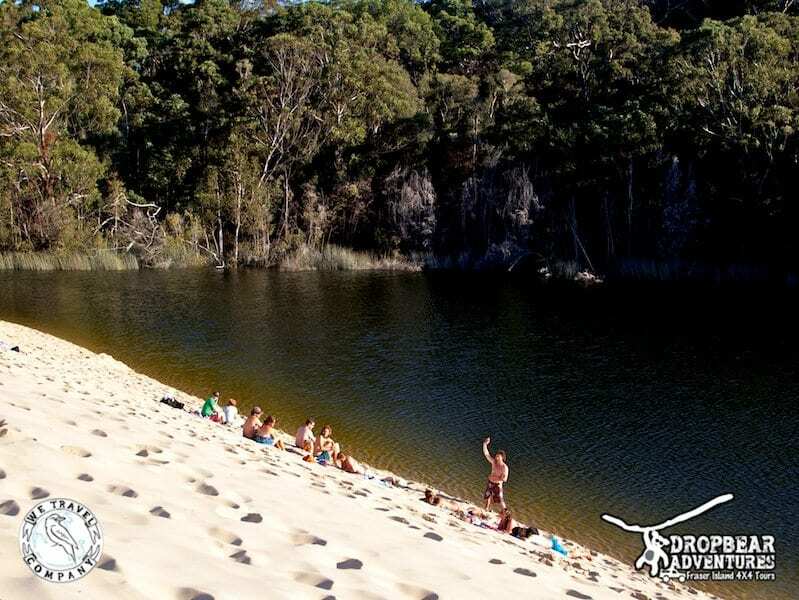 Don’t miss the opportunity of witnessing and exploring its rich wildlife, fresh green waters, fine, delicate sand dunes, and colourful history while you still can by booking a tour with us at Drop Bear Adventures. Our popular Fraser Island camping tours include a trip to Lake Wabby and the rest of Fraser Island’s attractions, such as Lake McKenzie, Indian Head, Champagne Pools and more. Please contact us today and speak to our friendly team.